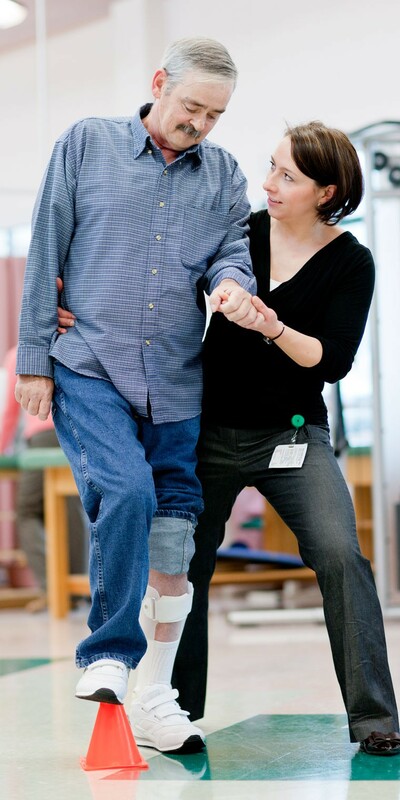 We have a team of physical therapists, occupational therapists,and speech and language pathologists with specialized training and experience in the treatment and evaluation of stroke. Occupational and physical therapists on staff have received training in new approaches to improve arm and lower extremity function after a stroke. Our therapists are using various techniques to decrease tone and assist the patient in performing isolated motions. Psychology/Neuropsychology services are available and considered essential to address the emotional adjustment following a stroke. Our neuropsychologists perform examinations that clarify for the patient and their families the impact of the stroke on brain function. This is very helpful when planning treatment and setting goals. The Stroke Program at St. Lawrence was developed to offer the best physical, cognitive, and emotional recovery for our patients following a stroke. The main goal of our program is that each patient achieves the highest level of function possible. Interdisciplinary team conferences to discuss patient progress, treatment plans, goals,and plans for discharge.